Enjoy the summer solstice this Thursday on our sun soaked patio where we will have a live DJ from 4-8pm and be giving out prizes. Most importantly, we are releasing our new Pump up the Jam beer just in time for those hot sunny days. 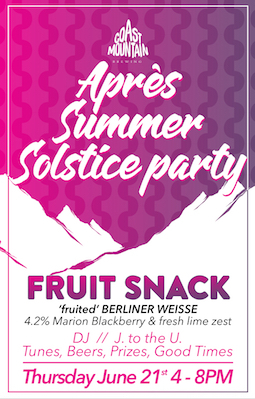 A fruited Berliner-Weisse with Marion blackberries and fresh lime zest, at 4.2% ABV this delicious beer is great for any time of day this season, so come join us for the first summer après of 2018!